Provide comfort for the family of Edith Lloyd with a meaningful gesture of sympathy. Edith Inez Lloyd, Age 89, loving wife, mother, & friend passed away December 27, 2018 at her home. She was born on August 24, 1929 in Newago County the eldest daughter of the late Frank & Inez (Graves) Wright. She graduated from Morley High School. She then attended bible college and upon completion went to work for the Christian Bible Mission where she went to small schools in farming communities with bible stories, music and verse. Edith spent summers teaching vacation bible school and at church camps. 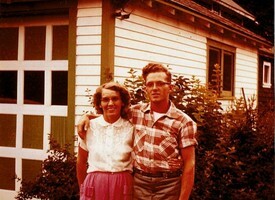 On May 18, 1957 she married the love of her life; Dennis Lloyd. Edith and Dennis joined the First Baptist Church of Manistee where Edith continued to teach the children about Jesus love and comfort. She served as a Sunday school teacher for several years. Edith dedicated her life to teaching the young children the love of Jesus. She enjoyed life to the fullest and had a passion for helping others. Edith enjoyed gardening and deer hunting with Dennis. After Dennis retired they spent several winters in Florida. She is survived by her husband; Dennis, sons; Daniel Lloyd of Manistee, Samuel (Charlotte) Lloyd of Free Soil, Philip (Vicki) Lloyd of Fountain, step-son; Denny (Debbie) Howe of Manistee, step-daughter; Stella (Jerry) Bakham of Ludington, numerous grandchildren and great grandchildren, & one brother; Frank (Darlene) Wright of Newago. She was also preceded in death by a son; Paul, sisters & brothers-in-law; Pearl & Lester Maurer, Mable & Harvey Aymor, brothers & sisters-in-law; Clifford & Christina Wright, Walter & Beulah Wright, and Ernest & Eva Wright, brother-in-law; Jim Lloyd, and nephews; James G. & Thomas V. Lloyd. Funeral Services for Edith I. Lloyd will be held Friday, January 4, 2019 at 11:00 AM at the First Baptist Church in Manistee with Pastor Paul Duby officiating. Burial will be in Maple Grove Cemetery in Free Soil. The family will receive friends at the Oak Grove Funeral Home & Cremation Center in Manistee on Thursday January 3rd from 4-7 PM and at the church on Friday from 10:00 AM until time of service. Memorials in Edith’s name may be directed to the First Baptist Church in Manistee. 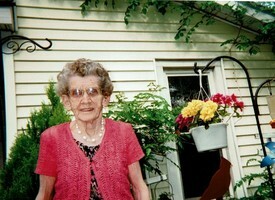 Visit Edith’s personal page of memories at www.oakgrovefh.com. Arrangements by the Oak Grove Funeral Home & Cremation Center in Manistee. 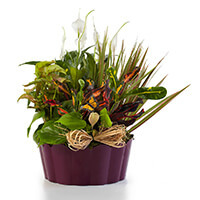 To send flowers in memory of Edith Inez Lloyd, please visit our Heartfelt Sympathies Store. Loved ones and Ed Hummel & Dennis Beaudrie have sent flowers to the family of Edith Inez Lloyd. Aunt Edith will be greatly missed,she was always willing to give a big hug and smile to you, sometimes you didn't even know you needed it. THANK YOU for showing me JESUS and Love. 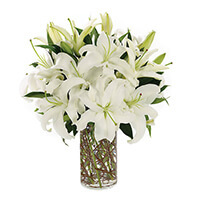 Loved ones purchased the SIMPLY LILY-WHITE for the family of Edith Lloyd. Ed Hummel & Dennis Beaudrie purchased the Plants-A-Plenty for the family of Edith Lloyd.